"A popular style that you can make your own." "Space them as close together or far apart as you need." "Combines classic farmhouse style with clear glass shades." "An easy solution for adding illumination just where you need it." "This unique star-shaped pendant is a new twist on the classic lantern shape." "You don’t have to get out of bed to turn off the lights." "14 different cord options to make a real style statement." The most versatile light will work for a variety of spaces, whether it’s above a kitchen island, hung from a breakfast nook or tucked into a powder room. The best pendant light for multiple spaces will send light down and outward, too, not directly down toward a single task, to work as both surface lighting and ambient lighting. And style-wise, the best pendant light for most folks will have a design that plays nicely with many decorating styles, including farmhouse, modern and industrial. That’s why our pick for the best overall pendant light comes in a classic warehouse-style shape, a popular style that you can make your own through slight variations in shape, finish and size. This one has clean lines and comes in six different finishes — including kelly green and cherry red, alongside the classic neutral colors — to match just about any space. While some pendant lights can spend upwards of several hundred dollars, there’s no reason to pay that much — especially if you anticipate buying multiple pendant lights to work over a larger area, like above a kitchen island or to hang over a dining table. In that case, look for less-expensive lights that add up to what you’re willing to spend. One way retailers make that easy: by selling pendant lights in packs of three or more to save on shipping costs and, therefore, your overall costs. This set of three clear glass lamps will display popular Edison-style bulbs, and you can space them as close together or far apart as you need to do get the lighting coverage you’re looking for. In the kitchen, you need pendant lights not to just deliver on style, but to work as targeted surface lights for everything from cutting vegetables to paying bills at night. Because kitchen islands are typically long, wide areas, you will probably need more than just one light. Two large ones can typically do the trick, or a set of three or more smaller ones will work well, also. These can each be individually hung, or can all hang from one track to keep them perfectly aligned. 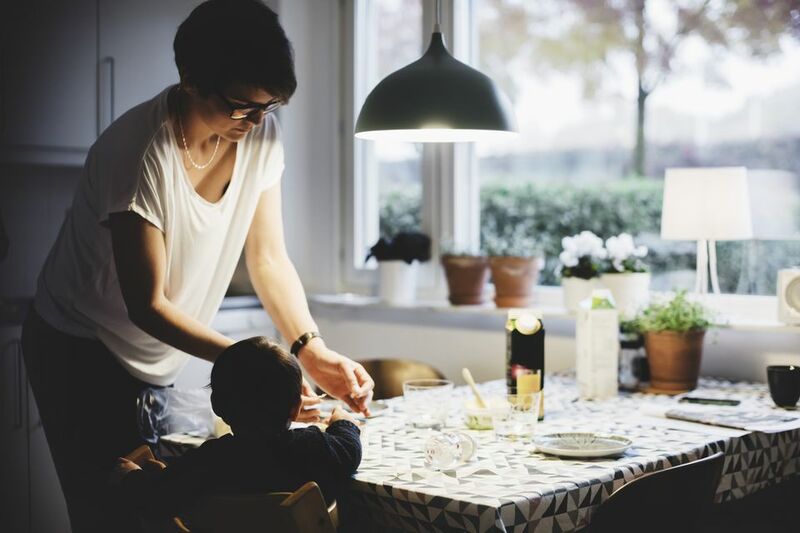 Make sure the lights hang at least 28 to 34 inches above the countertop so that you have space to work​ and consider going slightly higher if you’re a taller person or have kids who might think those swinging lights are toys. This 3-light set combines classic farmhouse style with clear glass shades and is height adjustable up to 45 inches. It comes in a 4-light version, too, for larger kitchen islands. Check out our other reviews of the best kitchen lights available on the market today. While many kitchen sinks have a window above them, many of us do our dishes in the dark after dinner instead of while the sun is shining. Enter the pendant light, an easy solution for adding illumination just where you need it without wasting the energy of having a whole roomful of lights on. Typically, the pendant light you choose to go above your kitchen sink will work with other lighting in the kitchen, if you have statement-making lights over the island or a breakfast nook, but it doesn’t have to match exactly! While you make want to keep some elements the same, like the general style or the metallic finish you’re using, it can also be an opportunity for contrast or drama. Generally, a smaller-scale pendant will do, and especially if your sink is in front of a window, consider a light with a clear glass shade that won’t interfere with the view during the day. This small, clear globe comes in three metal finishes to seamlessly work with your other lighting and hardware. Whether you have a two-story-high foyer or a simple vestibule, a well-chosen pendant light can set the tone for your home from the moment your guests walk into the door. Unless you’re working with a very small space, this is the place for drama: Use a larger-scale pendant light than you would elsewhere to create a statement. Often, lantern-style pendant lights are used in entryways since they cast light outward instead of downward to bathe the room in an overall glow, rather than pointing the light at a specific task. This unique star-shaped pendant is a new twist on the classic lantern shape that will work with a variety of decorating schemes. The popular pendant is on the smaller side for moderately-sized entryways and has more than 2,000 positive reviews on Wayfair. One key with entryway lights is to make sure you leave enough space beneath them for your guests to safely walk into your home, so make sure the one you choose can comfortably hang at least seven feet from the ground. A bare bulb hanging from a peg on the wall can lend a boho, industrial look, while a ceiling-hung crystal fixture adds a layer of romance. This sparkly pendant can be plugged right into your existing outlet and has an in-line on-off switch so you don’t have to get out of bed to turn off the lights. Hung above the sink, a fabulous pendant can add a hint of glamour to a small space, and use the help of the vanity mirror to reflect light through the room. It’s a good alternative or supplement to vanity lighting, with fewer restrictions space-wise to choose a style you love. Especially in a powder room, where you don’t need bright light for everyday tasks like shaving or putting on makeup, pendant lighting is a guest-friendly way to light the room without being garishly bright. It can also be a place to play with a fun lighting style, like this vintage-inspired cage light with Art Deco roots. Did you know you can turn just about anything into a pendant? A tin can, outdated globe and kitchen colander are just a few of the surprising objects that can be transformed with a simple pendant light kit. And before you worry that this is too big a project for a lay crafter, know that all you really need to know how to do is to drill a hole in whatever object you’re transforming, then screw it onto the lighting kit— it’s easy! This can be a great way to turn a memento into a decorative object or to give a space a truly unique look. The only real consideration is that the object you use not be too heavy (to pull out of the ceiling) or flammable (should the bulb get warm). Other than that, you’re imagination’s the limit! This pendant light kit is a simple plug-in option and has 14 different cord options to make a real style statement.